To the long list of single, ambitious women in our politics, add another name, Shobha Karandlaje. The panchayati raj and rural development minister in B.S. Yediyurappa’s crisis-ridden cabinet—and the chief target of the BJP dissidents—may not be a Mayawati or Jayalalitha yet, but it’s certainly not for lack of self-belief. After all, Karnataka’s never produced a leading political lady and she believes that her acumen and Sangh affiliations will take her there one day. But for a couple of years now, what has added grist to the rumour mills is the indiscretions of Yediyurappa himself. Instead of being sensitive to the conservative emotions of his partymen, he’s encouraged Karandlaje to be by his side on public platforms and at ceremonial occasions. He’s made her part of his foreign travel entourage and, out of turn, given her some key responsibilities. For instance, it’s a well-accepted convention that the seniormost minister should brief the media after a cabinet meeting—but Karandlaje was given that responsibility. Also, when senior ministers took departmental files to the CM, he apparently asked them to ‘run it past’ her before he put his initials. Then again, she was made in-charge of an important district like Mysore, although she hails from coastal Dakshina Kannada. Most recently, an attempt was made to make her the face of the government’s flood relief operations in the north. She is the only woman in the cabinet and her detractors allege it’s a ‘deliberate’ move to keep out the competition. Besides, Yediyurappa’s status as a widower hasn’t helped—his wife Maitra Devi was found dead in October ’04 under mysterious circumstances in a water sump at the Shimoga family home. When senior ministers brought files to the CM, he asked them to run it by Karandlaje before he initialled it. Shobha’s critics argue that her status in the government is not commensurate with her experience. She was nominated as an MLC in ’05 and in April ’08 was given a ticket to contest the Yeswanthpur assembly seat in Bangalore, which she won by a wafer-thin margin of less than 2,000 votes. For a first-time mla, she was given a weighty portfolio of rural development and panchayati raj. In fact, Karandlaje became a full-time BJP worker only in 1997 (and claims to be the first woman to become so in the state). 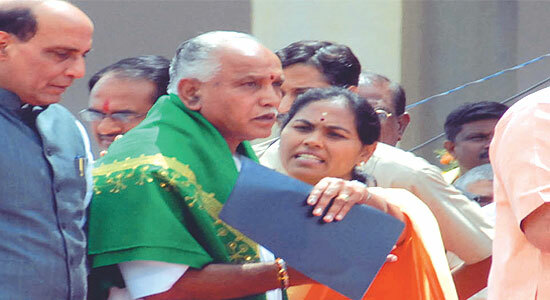 She hails from a middle-class Gowda family from a village, Charvaka, in Dakshina Kannada district. Her family had rss links and her brother was a pracharak. In the Sangh tradition, she even refused to marry. “My parents were disappointed, but later accepted it. The Sangh is everything to me now,” she says. Karandlaje has a postgraduate degree in social work. She was also the typical student-activist, opposing the Cogentrix power project in Mangalore, participating in the ‘Save Western Ghats’ campaign and acting in street plays. Her classmates remember ‘Baby’ as a friendly and helpful person. One friend even suggested that ‘Shobha’ was a name she chose after her entry into politics. As a student, she was so low-profile few even recall her original name. Before she plunged full-time into politics, she worked as a research assistant in Bangalore and then as a medico-social worker in Manipal. But even as Karandlaje brushes up her credentials and looks into the future, her impatient critics say she is to BSY what Lakshmi Parvathi was to N.T. Rama Rao in Andhra Pradesh. Meaning, she’ll vanish from the political scene should he be asked to step down. The jury is still open on that one though.